Crystals 3D was inspired by passion for beauty. By chance, in one summer resort in Europe, walking along the promenade we saw a booth with 3d engraved crystals. We did not know such technology, but we were told it was laser engraved optical art glass. We took, with a special 3d camera, a 3d picture of the whole family. Since then we have started searching for crystal engraving, which became our passion. We had to learn how to engrave in glass, how to take and convert 3d pictures or how to engrave 2d pictures in crystals. When back office and software were ready, we started creating our first 2d projects in crystals, and this is how we engraved our first crystals. As always, at the beginning it was not so easy, we needed to deal with rough times, we had to get familiar with new software, we made lots of mistakes – laser engraving is not so easy, after all. But anything is possible, so obviously engraving got our passion in a very short time. The first option is a 2d picture conversion to 3d format. We charge extra for such service, however, its cost depends on work complexity, what means we give you price before we start 2d to 3d picture conversion. We will start work only if you confirm the price. We do not charge for the other project element, such as extra text or inscription, logo or the other 2d pictures. The other option is taking 3d picture in our studio in Wroclaw, Poland. This solution is not being charged extra, what means it is already included in the project and crystal price. You have to know, that does not matter which option you choose, the final 3d picture will not be 360º 3d model. This means you will see the front and both sides of the faces, however the back will not be seen. Why is that? First of all, because it is a 3d picture, not a 3d model. Secondly, the crystal and engraving are transparent, what means that engraving 360º 3d picture would harm the overall visibility and clarity of the project. Only 360º 3d models can be engraved with good engraving transparency (animals, cars, machines, objects). 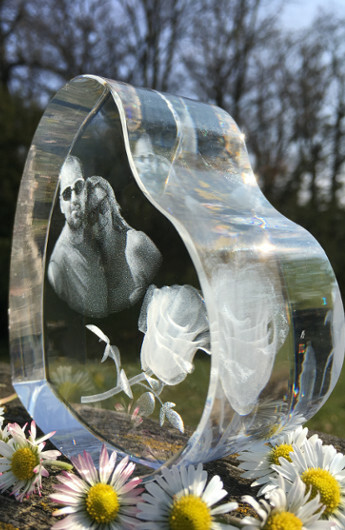 You can personalise any 3d picture engraved in glass, by adding to it personalized inscription. What is a photo crystal (or foto crystal)? It is a crystal with 2d picture engraved. Such crystals are ideal gifts for many important days and occasions, such as birthday, name day, Valentine’s Day, Women’s Day, Mother’s Day or Christmas. What is being engraved in a photo crystal? In general, they are wedding pictures, pictures of couples in love, pictures of grandchildren for Grandparents’ Day, for Mother’s Day or just a holiday picture to keep it as a nice holiday memory. Such crystals are rather thin, to keep it as a kind of a picture frame. Send us a picture, even with the background you want to have deleted, and we will adjust it (or even remove useless background), add some seasonal ornaments and prepare the whole project. Crystals 3D – fact or myth? The price depends on the crystal size and shape. We personalize projects for free. So, what can be engraved in a fixed crystal price? 3d model, 3d object (as long as it is chosen from our 3d models library or you provide us a ready 3d model in .obj format). If you wish to have a 3d model that we do not have in our own resources, we may quote it separately. Wroclaw in Poland, is where we work – where we design and engrave, but we are an on-line shop. We have already, as any other dotcom, posted thousands of engraved 3d crystals into many places in different continents, and the price of crystals is the same for our customers in Milan, Berlin or Edinburgh. The only difference can be currency. The only you have to do is to send us your 2d picture and we will price the conversion for you. Such conversion is one of two cases only when we need to charge extra for the project element. We quote it every time individually, based on the complexity of work that has to be done to complete the task. There is not any engraving price list, as in most cases we do not charge extra for projects. If one of those is your case, we will inform you about the price before we start the task. Once we have all project details provided, we will send the project for your approval in max. 2 working days, but very often on the next working day. We need 1 more day for engraving and the crystal is being sent to you by courier (on the next working day), providing that we got the payment confirmation. Our crystals are personalised according to your expectations, that is why we do not accept collect on delivery. Once the project is accepted, we are waiting for your transfer confirmation. Only when we have the payment posted, we start engraving with no delay and ship the package, most often on the next working day. Our identification mark is that any client of ours is the same important for us, what means we personalise each 3d project and engrave it in crystal according to your expectations. That is why we will be happy to answer your questions, advise about the crystals and projects. We want you (and the ones who will be given with the crystal) to be satisfied with the project.